The qípáo or ch'i-p'ao, also known as the cheongsam or mandarin gown, is a body-hugging (after Shanghai modification) dress for women in China originating from the Manchus, modernized and improved in Shanghai. The English loan word cheongsam, which comes from the Cantonese pronunciation of the original Shanghainese term, is used for the garment when worn by either men or women. The word qipao refers only to women's clothes. Cheongsam was the formal dress for Chinese men before Western-style suits became common in China; it is not often worn today, except during traditional Chinese celebrations or as stylish party dress. 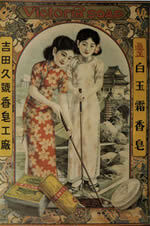 Left: Two women wear qipao in this 1930s Shanghai advertisement. When the Manchu established the Qing Dynasty over all of China, certain social strata emerged. Among them were the Banners (qí), mostly Manchus, who as a group was called Banner People pinyin: qí rén). Manchu women typically wore a one-piece dress that came to be known as the (qípáo or banner quilt). The qipao fits loosely and hung straight down the body. After 1644, all Han Chinese were forced to make a close shave and dress in cheongsam instead of Han Chinese clothing (Ti Tou Yi Fu), or they were to be killed. For the next 300 years, the cheongsam became the traditional clothing of the Chinese. The garment proved popular and survived the political turmoil of the 1911 Xinhai Revolution that toppled the Qing Dynasty. The qipao has become, with few changes, the archetypal dress for Chinese women. The modern version of the qipao was first developed in Shanghai around 1900. Slender and form fitting with a high cut, it contrasted sharply with the traditional qipao which was designed to conceal the figure and be worn regardless of age. In Shanghai it was first known as Cheongsam (or long dress. Mandarin: chángshān, Cantonese: cheongsam, Shanghainese: zansae). The cheongsam (the Cantonese term later popularized by Hong Kong) went well with the western overcoat and scarf, and portrayed a unique East Asian modernity. As Western fashions changed, the basic cheongsam design changed too, introducing high-necked sleeveless dresses, bell-like sleeves, and the black lace frothing at the hem of a ball gown. By the 1940s, cheongsam came in transparent black, beaded bodices, matching capes, and even velvet. Later, checked fabrics also became quite common. The 1949 Communist Revolution ended the cheongsam and other fashions in Shanghai, but the Shanghainese emigrants and refugees brought the fashion to Hong Kong where it has remained popular. Recently there has been a revival of the Shanghainese cheongsam in Shanghai and elsewhere in Mainland China; the Shanghainese style functions now mostly as a stylish party dress.